I managed to get hold of the Mango white dress from ASOS and a few other bits and pieces. I will photograph the rail before I set off on my travels. I wish I'd taken a photo because she was one of the most beautiful persons I've met in real life both inside and out. The pleasure of my work is I get to meet lots of people constantly and I forget how enriching this can be. 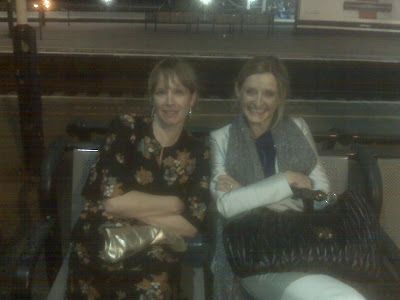 And just in case you think the life of a stylist is glamorous in anyway, I give you Deirdre & Doris (myself and Isobel Kershaw) on Friday night after a few drinks sat on a bench in Clapham Junction wishing we were anywhere else but where we were! Your job sounds like great fun - apart form the Clapham bit! Rats. Wish I lived in Blighty I'd pop along. Make Do Kate what about Fergie??? Dreadful business. you sound like you have a great job ! You're job sounds like lots of fun, and I love the dress you're wearing! shame its up North, it would be great to come, hope you enjoy it! Whats wrong with Clapham Junction?